Calphon squints at dark storm clouds on the horizon. 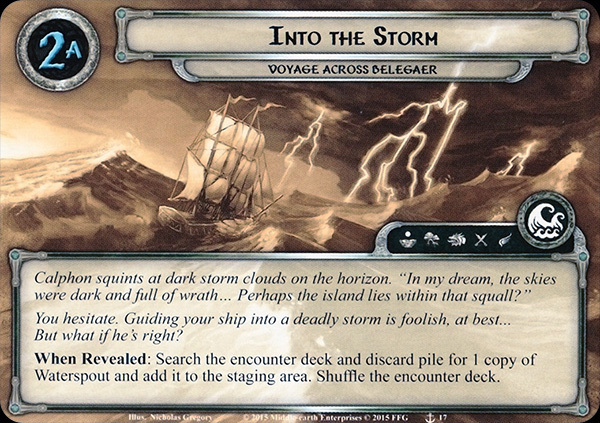 "In my dream, the skies were dark and full of wrath... Perhaps the island lies within that squall?" You hesitate. 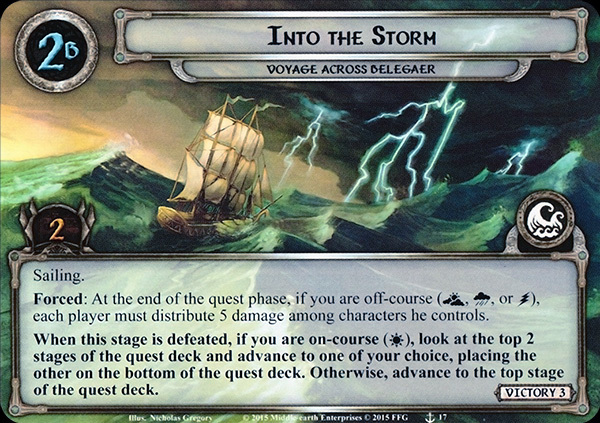 Guiding your ship into a deadly storm is foolish, at best... But what if he’s right? When Revealed: Search the encounter deck and discard pile for 1 copy of Waterspout and add it to the staging area. Shuffle the encounter deck. Forced: At the end of the quest phase, if you are off-course ( , , or ), each player must distribute 5 damage among characters he controls. When this stage is defeated, if you are on-course ( ), look at the top 2 stages of the quest deck and advance to one of your choice, placing the other on the bottom of the quest deck. Otherwise, advance to the top stage of the quest deck.